In northern New Mexico, adobe is a fact; homes made of sun-dried bricks pepper the high desert landscape. I grew up in an adobe home. It belonged to my great-grandmother, Juanita, and her husband, Rosenaldo. The walls were over twelve inches thick, bulbous and uneven, finished on the interior and white washed. So thick were some walls that they required even thicker buttresses to hold them up. In northern New Mexico, those structural add-ons were dubbed “suspenders.” It’s an idiosyncratic way of describing their function, holding up walls. The term almost humanizes the place, making me think of my great-grandfather who also donned his own kind of suspenders. Each adobe that comprised the home was made by hand, no doubt by a distant relative, perhaps an uncle or cousin. It was a communal effort. Rooms were built extemporaneously because there was no floor plan, only the necessity to expand when the family also expanded. Uneven adobes cover all the walls, making curved lines from hard angles. The result was something like a crescent moon, an undulating surface that deviated from the linearity of the walls that lay beneath. It was a transformation of the white cube into a brown rotunda. Rafa Esparza, one of sixty-three artists included in the 2017 Whitney Biennial, built each of these adobes by hand, transforming the John Eckel Foundation Gallery (the only free space open to the public) into one filled with what the artist calls “brown matter.” It surrounded me, the brown matter, both in front and below where my feet stepped on larger uneven square adobe tiles. The space felt cooler inside, typical of the substance; once at a particular temperature, it maintains that climate pretty consistently. It was respite after walking the streets of Chelsea to arrive at the Whitney’s new location in the Meatpacking district. It stood out for that reason. Among the minimalist and white of the entire neighborhood of high end galleries, Esparza’s adobe offered the brown and the gritty, dirt remade into building blocks. It was aptly titled, Figure Ground: Beyond the White Field, a play on words: the figure and the ground had become totally indistinguishable. In fact, the ground had totally overcome the figure. As Esparza points out, it’s a rarity to be surrounded by that much earth; this is especially true in New York where it’s hard to come across unadulterated patches of earth. Yet, so common is adobe that it can be found from the Great Mosque of Djenne in Mali to the Mission Churches of California. It can also be found in the home state of Esparza’s father, Durango, in Mexico, and my own very small village of Truchas. When I lived there, the exterior was covered in brown stucco and the once-flat roof was replaced with a pitch. It was more convenient, a choice made when my great-grandparents become too old to tend to a material that was in constant need of care. 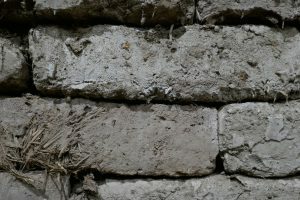 Before that, the adobe bricks and the exterior mud finish that covered them had to be recoated annually. That job was the province of women, who were called enjarradoras. The word is old, so old that the translation doesn’t really exist today. That is true of many words in northern New Mexico, where the Spanish retains its colonial character. Enjarrar, now, means “to sway.” I suspect that the movement required to replaster a wall was like swaying. It’s beautiful in that sense, a word that describes the physicality of making. My great-grandmother hired these women in the spring and their payment usually came in the form of food: carne seca (beef jerky), chile secado (dried chiles), canned fruits and vegetables and freshly baked bread. On occasion, my great-grandfather bartered his services as a blacksmith. My mom still remembers helping the enjarradoras. When she was young, she handed these women buckets of prepared mud up the latter. With their bare hands, and sometimes with the aid of an animal hide or smooth stone, they plastered the exterior surface. My dad imagined how many bricks he needed in order for him to make a house, and what it was going to look like, like how many rooms, who was going to live in it… I feel that whole process is also creative, and I wanted us, my father and I, to learn and feel this history, to embody that history and inherit it, even if it was only for the span of three or four weeks. Because I don’t want the practice of making adobes, that way of working in and with land, to end with us. To this day, ruins of old adobe homes in New Mexico almost outnumber the homes that are still standing. Walls are mere shells; over time, wood beams that once held the ceiling have caved under the burden of gravity. Entropy. New construction materials have replaced the age-old adobe. Stick and fiberglass insulation have taken the place of mud, straw and water. Still with its decline in use in my area, adobe has become something of a boutique commodity, an expensive building block far from its humble beginnings. I can safely say that for my relatives, the rough bricks amounted to utility. Now, at least in New Mexico, adobe has absorbed a new significance: it has become stylish, a marker of a romantic past, appropriated by transplants to the area. There is even a factory where adobe is produced, just between Taos and Santa Fe: according to the website 20,000 bricks are produced each day. Some are handmade and others stabilized with different materials—blended soils and asphalt emulsion—made to last the test of time. When Esparza makes the batches of adobe the initial piles of mud mixture are shapeless mounds shoveled into wheelbarrows after achieving the right moisture content. Muck covers the artist’s jeans in a thin layer of crust as he explains the process; there must be 30% clay content in each batch. If I looked closely the fingerprints could be made out on individual bricks. I couldn’t help but think about someone’s hand carefully patting down the mud into its individual frame. Similarly, pieces hay poked out of the walls. Fragments of the adobe bricks had eroded since the March openiing. Pockets along the edges of the floor accumulated these bits. 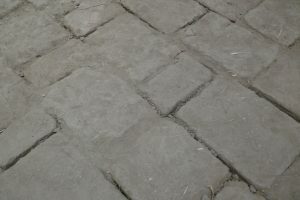 Floor tiles cracked, bearing tiny faultlines. The adobes’ materiality was undeniable; their breakdown in the gallery was unsurprising given the instability of the bricks. This is because adobe is not not fired in a kiln. Rather, bricks harden and bake under the sun. As a result, adobes are known to contract and expand depending on their surrounding climate and humidity, thus retaining their organic character even when formed into a building, or here, a rotunda wall. In this way, impermanence defines them. Or perhaps it’s not so much impermanence, but the ability to transform. Adobes come from and can go back to the earth. They are constantly in flux. Brown matter. The bricks “built up a space’, inhabiting it in a way. For the artist, this act of building was significant because white cubes have historically only reflected whiteness. This is a racial whiteness, one that immediately calls to mind skin color, ethnicity and more now, (hyper)nationality. But it also calls to mind something more diffuse, but perhaps more powerful, an institutional whiteness, in which systems of power are built upon systems of physical (though interpreted as social) difference. Art institutions, as one example, have historically limited the kinds of artists and viewers (people of color and queer) allowed to inhabit certain spaces, especially American museums and galleries. 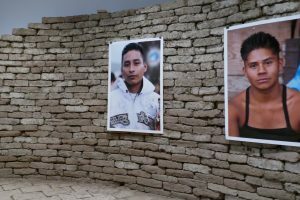 White cubes, in other words, don’t often reflect the color of of the artist’s own skin, “and other bodies that aren’t represented in traditional spaces.” Creating the adobes and placing them in the gallery was the artist’s response. “Building up a space of brown matter is creating a space that I hadn’t been in before.” It was a way in which browness inhabited, even overwhelmed, the gallery, overturning the racial power dynamics of the Whitney Museum and the whole of Chelsea. The argument for materiality, for being overwhelmed by the brown mud and horse-dung mixed bricks of indigenous and mestizo spaces, is also an argument for belonging: brown adobes evoke melanin-tinted bodies. Of course browness is neither singular nor archetypal. Rather, brown has the potential to evoke an idea as much as a color, or a range of colors, from coffee to caramel, and from mahogany to adobe. In ethnic terms, brown can define Latin American, African/African American and Afro-Latino and Asian bodies that outwardly present non-white qualities. Often this definition is hard to pinpoint because brownness is a red herring, just as whiteness is; it is mostly an assumed marker of social difference writ large on the body. But what that difference is remains ambiguous, though always interlinked with concerns about language, education, and morality. What is certain is that to be brown, in America and elsewhere, is to experience oppression in some form. Yet even with this in mind, brown can only be approximated in words, for brownness (an as experience, skin color, ethnicity, etc.) is itself indeterminate, just as brown matter. Both are diffuse. When brown matter inhabits the white cube it therefore exerts a certain kind of weight, the weight of materiality on the one hand, and the the-often unarticulated experience of browness, an identity that is assumed as much as it is projected, on the other. This is a one essay of a two-part post.